This year's event included 167 Emory students, 704 Emory staff/faculty and 40 Emory alumni — plus many more community members who volunteered to help with the running of the event. A record amount of money to benefit cancer research in Georgia was raised at the 4th annual Winship Win the Fight 5K held on Saturday, September 27, 2014. Winship Cancer Institute of Emory University says it surpassed its half-million dollar goal and brought in more than $595,000. Over three thousand runners and walkers participated in the event that started and ended on the Emory campus and wound its way through the surrounding Druid Hills-area. "We are so grateful to all the supporters who joined us at this year's Winship 5K," says Walter J. Curran, Jr., MD, executive director of Winship. "The money raised will support more than a dozen cancer research projects at Winship and will lead us to more and more success stories in our fight against cancer." 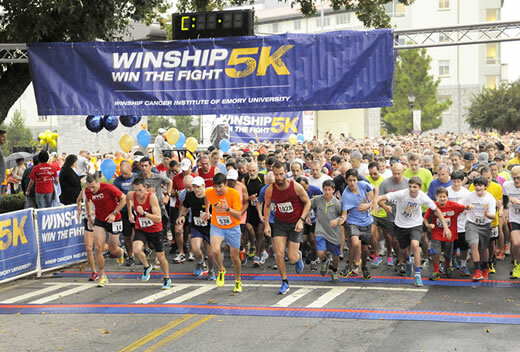 The Winship Win the Fight 5K is unique because it allows participants to direct their tax-deductible donations to benefit specific cancer research based on their personal interests. Donations will be accepted until November 14, 2014. For more information, go to: winship5K.emory.edu. The Emory University community particpates wholeheartedly in the event. This year's event included 167 Emory students, 704 Emory staff/faculty and 40 Emory alumni — plus many more community members who volunteered to help with the running of the event. Plans are already in the works for the 5th annual Winship Win the Fight 5K to be held on Saturday, October 3, 2015.